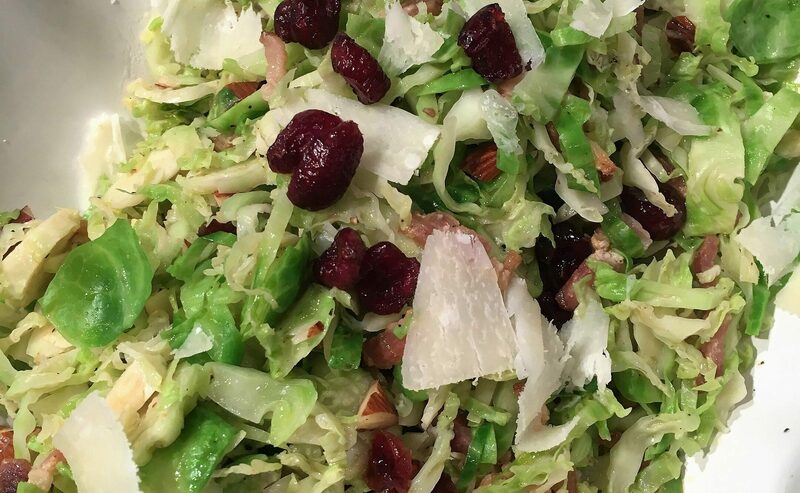 Tender Brussels sprouts, with crisp bacon and almonds with sweet cranberries and Parmesan cheese. A light dressing binding all the flavors. We try to have at least a couple of side vegetables dishes every night for dinner, and when I come home from the grocery store with something other than mixed green, smiles are showed in appreciation. A subtle hint that we have salad too often I guess. Tonight I have a new recipe to share with all of you using Brussels sprouts. Fall is finally upon us and bacon is seeing it’s way back to the kitchen again. The blending of bacon, almond and dried cranberries goes well together. The dish was perfect alongside roasted chicken, however you can also enjoy it cold as a salad at lunch time. In a large pot of boiling salted water, blanch the Brussels sprouts for a couple of minutes. Drains, rinse under cold water. Place the Brussels sprouts back in the pot with cold water and ice cubes to stop the cooking. In a medium skillet place the bacon and cook over medium heat until crisp. Add the cranberries and the chopped almonds. Mix well and cook for another 1 minute. Add the Brussels sprouts to the bacon and cook while stirring for another minute or until warm. Place in a serving dish and add the olive oil, lemon juice, stir well and place the shave parmesan cheese over it.